Wouldn't everything be a little nicer if it were inflatable? Imagine being able to move in just a few hours thanks to inflatable furniture. Or planning on having a cookout? Good thing you brought your inflatable kitchen. Gotta be in Chicago in two hours? What a great time to have packed your inflatable plane. Unfortunately, science has let humanity down big time and hasn't developed inflatable everything yet. 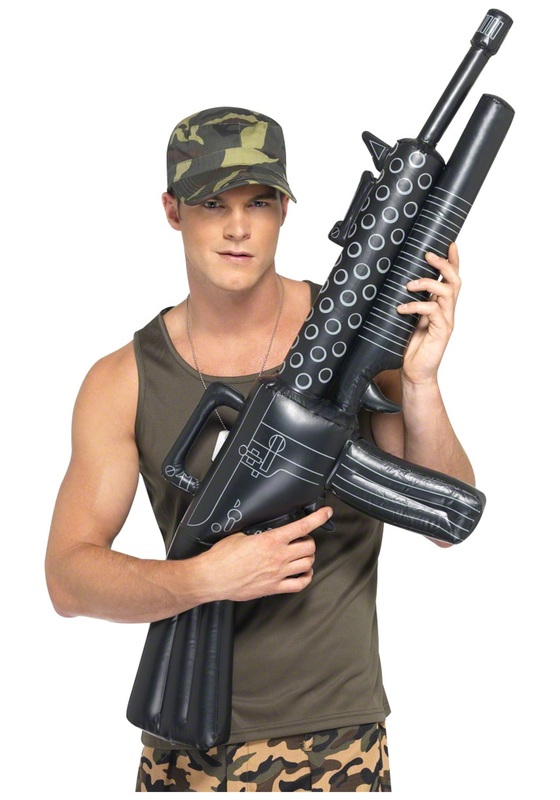 But they have developed the inflatable machine gun, which works out pretty well if you're looking for a quick and easy accessory to go with your soldier or gangster costume. In the meantime, while we're all waiting for the scientists to build us an inflatable home theater, at least you'll be able to look way cooler in your army costume.